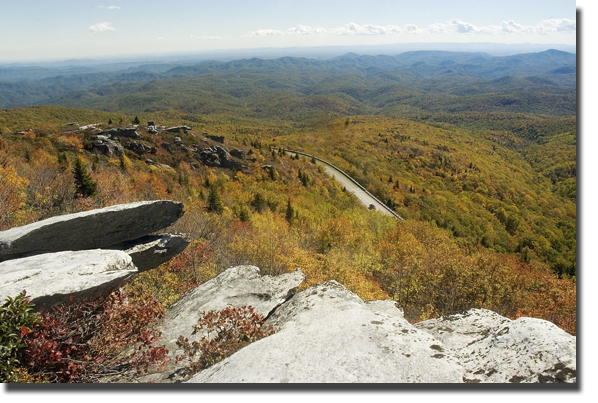 Ok, this image is for all three of you who aren't in the Blue Ridge Mountains today enjoying the scenery. Don't fret though. Today's weather looks just like this pretty photo I took on top of Rough Ridge yesterday. But we all know looks can be deceiving. Right now the weather outside is windy and the high temp may reach 50 degrees. So those of you not up here can smirk a little knowing you once again fooled Mother Nature by staying away. Oh, and if you are looking for fall foilage, you'ns may want to run down to Lenoir or Wilkesboro 'cause I think that is where the leaves blew during last night's windstorm. Sorry.